Great time to visit one of the many bustling, noisy and constantly active colonies. Now is a great time for getting out and seeing some of Britain’s amazing nesting seabird colonies. We have plenty of spots along our coast that offer fantastic close up views of birds on nests and if you fancied an even more interactive experience the Farne Islands are always popular – although you must remember to take a hat…….. and maybe a change of clothes! Gannets are early arrivals, returning back to the UK in January and staying here until August / September. At the moment they can be seen sat on nests. The RSPB estimates that there are 218,546 nests in the UK. The egg incubates for forty days and once hatched it is another ninety days until the chick is ready to fledge. 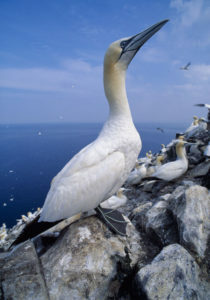 Due to decreasing food supplies, partly caused by a rise in sea temperature, Gannets are now forced to travel further in the search for food with many undertaking round trips of more than 1000 km to the Norwegian coast. Kittiwakes arrive back to the UK coast line around February and stay until late summer/ early autumn. The RSPB estimate that there are 379892 nesting pairs in the UK. Some of the best places to see them are Bempton Cliffs near Flamborough. Puffins arrive back at their breeding colonies in March to April and stay until the middle of August. Their comical appearance endears them to lots of people and ensures they remain one of Britain’s best loved summer visitors. The Puffin’s beak is serrated helping it hold onto fish and you will often see these birds with beaks packed full of sand eels. 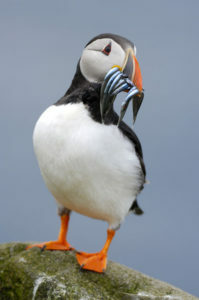 The most recorded sand ells held in a Puffin’s beak is 83!! There are many places in Britain where you can get a close encounter with these birds, with the Farne Islands (Northumberland) being one of the best. As well as the above our sea-bird nesting colonies attract many other species of birds such as Razorbills, Guillemots, Fulmars, Herring Gulls and Shags. If you are lucky you may also get a good view of a raptor as the sea-birds make a relatively easy target for them. Peregrines are becoming an increasingly common site along our coastlines, these magnificent birds are the UK’s fastest bird being able to stoop at up to 180km per hour. The sight and sound (not to mention the smell!) of our sea-bird colonies really does make visiting a trip to remember. Another bonus when visiting many of our seabird colonies is that you are able to get very close to the nesting birds and enjoy such close up views of so many individuals at close quarters. A highly recommended experience!